Are you living or visiting the upstate New York area this weekend? Come check out Shelter at the 20th Annual Woodworker's Showcare in beautiful Saratoga Springs, New York! The show, located at the Saratoga Springs City Center and put on by the Northeastern Woodworker's Association, will feature lectures, demonstrations, and all kinds of examples of fine woodworking from across the region. Shelter will be displaying great woodworking tools including Japanese saws, Flexcut carving tools, woodturning tools, Veto ProPacs, the Tormek Sharpening system, and an assortment of woodworking and building books. We have been installing structural insulated panels (SIPs) for years (24 to be exact). When we first started, we would cut the window and door openings on site. At the end of each job, the customer would usually ask "What can I do with all these pieces?" referring to the large stack of window cutouts. Somewhat tongue-in-cheek, I'd reply that the scraps would make a heck of a doghouse. Well, Amy and I now have three sons (6, 11, and 12), and I am always looking for a good project that the four of us can work on that allows me to impart the vast knowledge of carpentry my Dad has shared with me. Last spring I had a pile of SIP scraps taking up valuable real estate in our shop, and I found myself saying, "What can I do with all these pieces?" Then I found myself thinking "These scraps would make a heck of a doghouse." 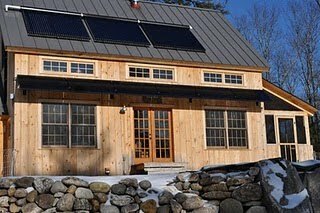 Last month on this blog, we shared with ShelterBuild readers details of a free class Shelter recently hosted on the subject of energy audits and energy efficient homes. Aaron Despres from Energy Solutions For Maine and Up-Country Building Inspectors, Inc. explained to the class three levels of energy audits you might receive from a commercial vendor and what you might expect from each. Aaron’s audit started with an exterior inspection of the home: checking the orientation of the home, type of siding, type of foundation (and lack or presence of insulation on foundation wall), roofing type and lastly checking for any indications of obvious envelope leakage. There is no such thing as a house built too tight, only inadequate ventilation.